Majorca and Ibiza are the most popular islands of Balearics. A lot of tourists come here every year because of its excellent geographical position, soft climate, big cultural heritage and spectacular see. Rental boats in Balearic islands are very popular due to huge yachting facilities and one of the best nautical infrastructure: ports for yachts, harbours, yacht charter agencies for rentals boats. Booking your yacht charter in Balearics you’ll have the opportunity to see the most picturesque bays, blue waters and coves. In continuation, we will propose some beautiful beaches and caves for your yacht charter in Majorca, Ibiza or Formentera. Is the bigest island of Balearics. The north of Majorca is very rocky with many coves of turquoise waters. The East coastline is very picturesque with many sandy beaches and protected areas. The Natural park that worth visiting is Cabrera. Many boats want to visit this natural reserve and if you want to anchor in Cabrera it is necessary to make a previous reservation by Internet. You can book Cabrera yourself or contact our managers if you would like them to help you with reservation for your yacht charter Majorca. Our suggestions for Yacht charter Majorca. A beautiful destination for yacht charter with a white sand and green pine trees. The crystalline water of light blue tones makes this bay an ideal place for yacht charter in Majorca where you can go swimming or just pass a relaxing day. Located not far from Palma. This bay with a small beach and beautiful rocks is like a paradise. The sea bottom formed by algae and sand creates the picturesque effect of water of different colours. The bay near the port Andratx. Cala Llamp is one of the famous destinations to pass a Day Charter. Its crystal clear waters are the ideal place for snorkelling and bathing. This bay has no sand but you can visit a restaurant with a swimming pool and a really good Spanish cuisine. This beautiful narrow beach near por of Pollensa, is surrounded by pine trees. Here you can contemplate the unique and rocky landscape. This small pebble bay is a bit hidden from the touristic routes and even during the high season here you can enjoy the silence. Also in this beach you can find several rocky caves to explore with a kayak or a paddle surf. This place is one of the few virgin coves that remain in Majorca in its virgin aspect. Here you will find a picturesque cave with a rocky surface. It can be a good option to anchor and spend some time during your boat charter in Majorca. Cala Mondragó is recognised as one of the most beautiful places for yacht charter on the east coast of Majorca. The pine trees descend almost to the turquoise sea that bathes the beach of fine white sand. Es Trenc is the longest beach of Majorca. If you would like to see the Caribbean in Majorca, you should visit this natural park. It is another jewel of Majorca. By boat ou can visit small picturesque caves and take a bathe in the crystal clear waters surrounded by many pines. Located 38 kilometres from Sóller Sa Calobra is a stunning set of two beaches tucked in among steep rocky cliffs. One of the most beautiful places of the northwest coast of the island. Sa Calobra is rather difficult to reach by land but if during your yacht charter in Majorca you will be on the northwest coast you should visit this paradise with spectacular views and rocks. A few kilometres from Sa Calobra we find Sa Foradada. This natural whole in the rock is one of the images that represent Majorca. The name is given to the end of this small peninsula, as it has a hole in the middle, the name is derived from the Catalan language forat that means a hole. We suggest you to visit the panoramic restaurant near the rock and tested the best paella in Majorca. There are many more picturesque places in Majorca. If you have any question or would like to have a help with the route for your boat charter Majorca, do not hesitate to ask advices from our captains who know all the corners of the Balearic Islands. If you are looking for a boat for your Yacht Charter in Majorca you can see our fleet for Day Yacht Charter or for Week Yacht Charter. Or you can send us the message with your criterial for a boat and our managers will send you the best offers of charter in Balearic islands. Contact our managers. Speaking about Ibiza, we should say that there are many Ibizas at the same time. Ibiza where the party doesn't stop for a minute, Ibiza that preserves its mediaeval aspect, Ibiza that film stars and celebrities from all over the world prefer. But we would like to show you the picturesque Ibiza with its blue waters. The lost coves, quiet corners — this Ibiza can be discovered only by boat. Enjoying an Ibiza cove is a unique experience, you will always discover different landscapes, sunsets that will always remain in your soul. It is a deep cove protected by hills with a lot of pine trees. It is considered a very safe cove for anchor. In summer, it can be quite noisy due to many restaurants and bars near. Many people come here to see the amazing views that you do not expect to find in Ibiza. It is another beautiful bay with rock bottoms and sandbanks between them. The crystal waters attract many boats and depending on the season can be quiet or not. Getting off the boat you will find many bars and restaurants to have a diner or have a drink. A small cove with white sand and rocks. Only for small boats. There is no doubt that is the paradise of the Mediterranean and the most popular destination for yacht charter in Balearics. Situated just 12 miles from Ibiza it has more than 80 km of a wonderful coastline to discover. You'll wonder if you're still in Spain! It likes more Caribbean. Perfect for snorkelling or diving. All the spanish stars prefer to pass their holiday in a yacht in Formentera. S'Espalmador, the iconic islet situated to the north of Formentera, privately owned, uninhabited island. It is one of the most beautiful beaches of the island, with good anchorage. A hundred meters from Espalmador is situated Illetas full of beach bars and restaurants. Formentera thanks to its unique water colour that you will not find in the Mediterranean anywhere else is called The Caribbean of the Mediterranean. 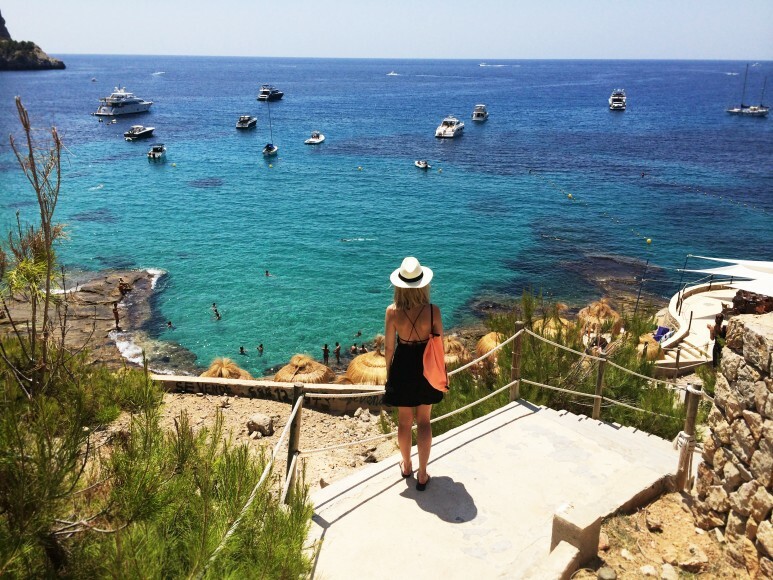 There are many more picturesque coves in Ibiza and Formentera. If you have any question or would like to have a help with the route for your yacht charter in Ibiza do not hesitate to ask advices from our captains who know all the corners of the Balearic Islands.